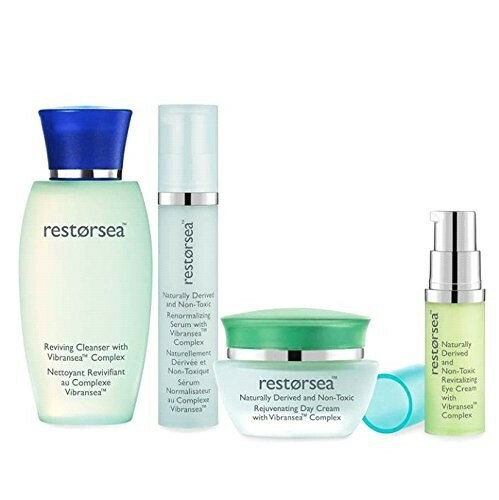 Powered by Vibransea complex, our Regimen delivers smoother, softer, more even-toned and radiant skin in just two weeks. Because most anti-aging products operate by burning through both dead and living skin cells, their prolonged use produces reactions such as skin flaking, thinning, redness and sensitivity to light. Anchoring our Vibransea complex, our proprietary enzyme Aquabeautine XL® dissolves only dead skin cells, leaving living ones to thrive and leaving you free from harsh side effects. All Restorsea products are: clinically tested, hypoallergenic, noncomegenic, dermatologist tested and suitable even for very sensitive skin. NO: parabens, PEGs, phthalates, silicone or mineral oil. Reviving Cleanser: Morning and evening, massage a dime-sized amount of cleanser evenly over damp skin, avoiding the eye area. Rinse thoroughly. Renormalizing Serum: Smooth two pumps of serum over the entire face, including the nose and avoiding the eye area. Apply morning and evening immediately after cleansing. Revitalizing Eye Cream: Using your ring finger, apply a pea-sized amount of cream under eyes in a half moon shape, dabbing from inner corner to outer corner. Apply morning and evening. Rejuvenating Day Cream: Smooth a dime-sized amount of cream evenly over the entire face, including the nose and avoiding the eye area. Gently massage into skin until completely absorbed. Apply each morning to clean skin. Store products in a cool, dry place. All products contain our revolutionary, proprietary Vibransea™ complex, anchored by Aquabeautine XL®, a natural enzyme released by salmon at birth. The enzyme's remarkable properties gently exfoliate only dead skin cells, allowing living ones to flourish.